If your travel plans only allow for a half-day Singapore city tour, you can make the most of your time and still see the best of the sites by using a tour company to help you plan your trip and get you around the city in a fast and logical manner. While you won't have time to spend hours at each site, you can still fill your camera's memory card with plenty of post-card worthy images. The following Singapore city tours are provided by two different tour company, you may choose either one that suits you best. 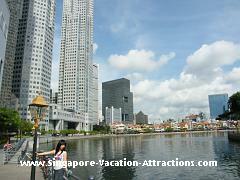 One of the popular Singapore city tour attractions - Merlion Park. View more photos. If you would rather tailor your Singapore city tour to your own interests and spend a little more time at different sites, you can do the Hop On Hop Off tour, following one of three different routes. The Green Route will take you through Esplanade, Merlion Park, into Chinatown, Clarke Quay and over to the Singapore Botanic Gardens. It also allows you to get in some shopping at Orchard Road. Buses stop at each location on the schedule about every half hour, so you decide how much time you want to spend at each stop. There are several stops along Orchard Road, so take some time to linger in the designer boutiques and architecturally delightful shopping centers. Clarke Quay. View More Clarke Quay Photos. The Red Route will take you through Sentosa Island's Attractions by way of Chinatown, Little India, and Arab Street. These areas are all prime dining and shopping neighborhoods, and buses arrive every two hours, giving you a little more time for exploring. If you're really short on time, stay on the bus until you reach the site that you are most looking forward to visiting. It's difficult to tour Universal Studios Singapore in just two hours, but if you get off at that stop, you'll have time to check out other Sentosa Island Attractions, such as the Images of Singapore museum. Little India is also a great place to spend the bulk of your morning, especially if you're looking for spicy treats, fantastic bargains and authentic Indian goods. If you want to hit the highlights of Chinatown, Little India, and Arab Street without going all the way out to Sentosa Island, the Orange Route may be your best bet. Buses run every hour at each location and stop at several Shopping Malls and other tourist attractions. This tour will take you through Boat Quay and Clarke Quay as well, two great stops along the Singapore River that feature dozens of places to eat and old-fashioned shophouses to pick up some unique goods. 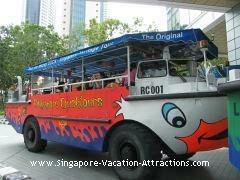 Travel the city by bus and boat with the DUCK & HiPPO Singapore city tour pass. The pass actually gives you a full day of transportation to various attractions, just like the above hop on hop off bus tour provided by the City Tour, and you could easily tailor the trip to meet your time constraints. This Singapore city tour consists of three different routes that will take you to various attractions throughout the city. With their special tour, you'll hit the highlights and have a chance to hop on and off at your leisure. Buses arrive at each stop approximately every 25 minutes. Start your day with an hour tour on a DUCK, a remodeled WWII amphibious Vietnamese war craft, around the Marina Bay. While you won't be getting off the boat for in-depth exploration, this is the perfect opportunity to take some awesome pictures. You'll have an opportunity to take gorgeous photos of the fascinating architecture of the Esplanade-Theatres on the Bay, and snap some images of the huge Singapore Flyer and Marina Bay Sands Integrated Resort from a distance that allows you to really capture just how massive these structure are. You'll definitely want to keep your camera out as you pass by Merlion Park so you can snap a few shots of the iconic Merlion statue. You may also want to check out Singapore River Night Cruise. After the short boat tour, hop aboard the DUCK bus for some more in-depth exploring. Clarke Quay is one of the highlights on the tour, but it's more active at night, so stay on the bus until you reach the Singapore Botanic Gardens. Head to the National Orchid garden and enjoy over 3,000 varieties of Singapore's national flower. Even if you're an amateur photographer, you're sure to snap at least a few pictures worthy of blowing up and hanging over your mantle, or passing on to your horticulture enthusiast friends. The next highlight of this Singapore city tour is Orchard Road, the famous shopping district for those who enjoy the finer things in life. If you're looking for high-end designers and unique gifts, spend a little more time here. If you prefer less expensive and more culturally authentic goods, skip Orchard Road and spend more time on the Chinatown and Little India Walking Tour. Boat Quay is a great place to end your journey and relax a bit by the gently rolling Singapore River before heading off to your next destination.